We wish to thank all 573 runners that participated in the 2018 Fall City Day Run. We are ever so grateful of our running community and look forward to again making donations to our local schools and youth groups from proceeds generated by this event. 30th anniversary of our race! Over $55,000 was donated to Snoqualmie Valley schools and to local youth groups from 2013-2018! The 10k and 5K races are USATF Certified and Sanctioned courses along country roads that cross the Snoqualmie River. Race courses are VERY flat and fast, so be prepared for a personal best time. The races are chip timed by Rogue Multi-Sport. Prizes and refreshments following the race. The Fall City Day 10k, 5k, and Kids 1k will start and finish in the heart of downtown Fall City, Washington, which is located about 25 miles east of Seattle via I-90 and 15 miles east of Redmond via Highway 202. The start/finish line is in front of the Farmhouse Market located at 33521 SE Redmond-Fall City Road, Fall City, WA 98024, near Olive Taylor Quigley Park, in downtown Fall City. Walkers and strollers are welcome, however, all participants must be finished by 10:30 AM when the course closes and reopens to vehicle traffic. The 10k and 5k will be chip-timed by Rivalry Events. We use a disposable bib tag timing product. Your timing chip will be applied to your bib and inserted in your registration packet. Water stations will be located just prior to both the 5k and 10k turnarounds. Only water will be provided. 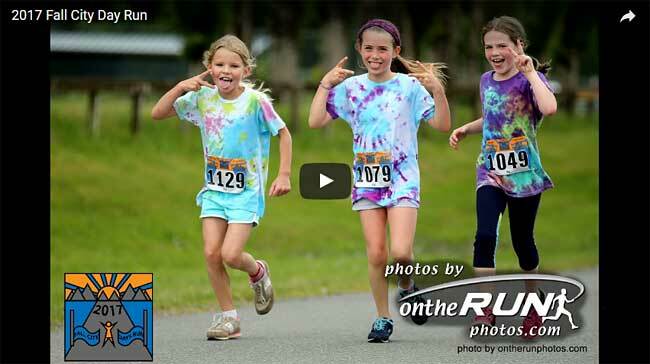 All race proceeds to once again benefit the students of the Snoqualmie Valley School District. Budget cuts have decimated funding for various programs and this event will raise funds the schools need to continue implementing some of the key educational experiences students need. Please help us support our schools! Race proceeds paid to each school will be based upon a percentage of participants supporting their school. A limited number of shirts may be available the day before and day of race but are not guaranteed. Please note: Tri-blend women's cut sizes run small. Please order a size larger than you would normally order. Sales Tax Exemption: As a 501(c)(3) non-profit organization, the Fall City Day Run fundraising event for local schools and community groups is exempt from collecting sales tax on its race entry fees. Prizes for the Top 3 Overall are TBA. Age group winners receive prizes. Awards run three deep. There are custom finisher certificates linked to each result. Participants can view and print their certificates at home or share them electronically from anywhere with email or social media. Download the free app for race results for Android and Apple mobile devices. Race times and results are live for each event (provided we have a mobile broadband connection at the venue).